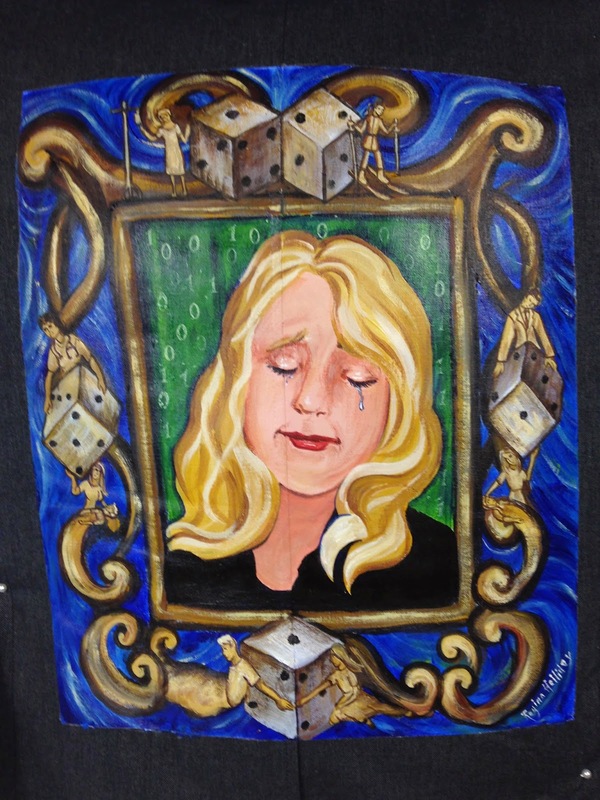 I paint the patient story. Many people know that. Others who closely follow my work know that my focus in advocacy is patient data access and the patient/caregiver role in the implementation and use of HIT (Health Information Technology). Last March, I was honored to do and interview with the elusive Tim from HIStalk about the current landscape in HIT. Tim is known only through his avatar and his writing. I met Lorre Wisham during the process of conducting the interview. She is the public face of HIStalk. She attends conferences and oversees the day-to-day operations of HIStalk as the Chief Operating Officer. She also has an avatar and that avatar is lovely. The image is based upon her real face. She almost seems like a Disney princess, the image in the looking glass, the fairest of the land. Lorre asked if she could join us in The Walking Gallery. I read her story of pain and cried. 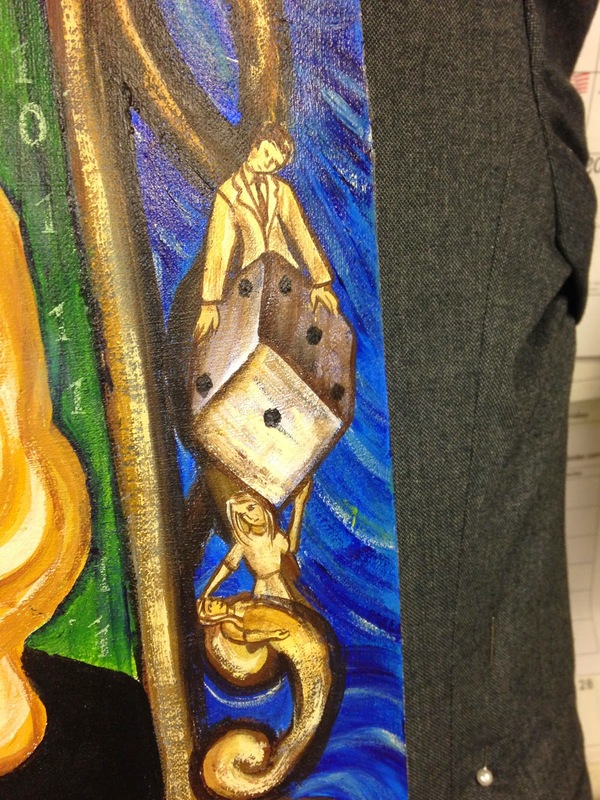 This is her jacket painting “Rolling the Dice.” Here we see the other side: the mirror’s flipped reflection. Here the princess cries for all that are lost. Lorre’s oldest daughter Danielle was a type 1 diabetic. She was diagnosed at the age of 12. She was a frequent visitor to emergency rooms and pediatric ICU for years. The smallest infection, like an ingrown toenail could upset her blood sugar. The doctors and nurses seemed to be rolling the dice when it came to treatment options. Many times Lorre’s daughter was in the hospital, finally stable, and they would bring her lunch. Lorre would tell the nurse that her daughter needed insulin if she was going to eat. The nurse would look at Lorre with a withering glare and the nurse would say that she knew better. Unfortunately, she did not. Lorre’s daughter would say, “Mom, I think my blood sugar is high.” She was right. Lorre had to covertly bring insulin with her to the hospital and administer it against medical advice. Once Danielle’s blood sugar was frighteningly off. Lorre took her to the emergency department at the local hospital. They stabilized her overnight. Lorre sat with her daughter and held her hand. The next morning the hospital decided to transfer her to the Pediatric ICU at a nearby facility. They removed her IV. Lorre and Danielle waited an hour for the ambulance to arrive. Lorre asked about insulin but was told they could not administer insulin in an ambulance without a nurse present. Lorre’s prior experience with insulin was intrabolus and it lasted for hours, so she thought everything would be fine. What Lorre didn’t realize was that when insulin is administered in an IV the effect is immediate, but ends immediately when the IV is removed. By the time they arrived at the second hospital and were able to admit her to the ICU, Danielle’s blood sugar was off of the charts again and she was in kytoacidosis. They started the IV and added insulin. She didn’t respond. They ordered new insulin from the pharmacy. By this time she lost consciousness, her blood gasses were off, and her brain started to swell. There were three physicians there, including an endochroinologist. They said they had done everything they could and she wasn’t responding. They didn’t think she was going to make it. She did survive that event and became conscious 12 hours later. Lorre and Danielle were able to spend many lovely years together. If you look at Lorre’s facebook page you will see Lorre with her two daughters at Christmas time. Sadly, Danielle died almost ten years ago in a car accident. It was never determined if her blood sugar levels were a contributing factor. Lorre’s grandmother was hospitalized three years ago. When Lorre arrived at the facility her grandmother was in tears. Lorre’s diabetic grandmother had been taking hydrocodone for pain every 4 hours at home. She also took 16 other medications and carried a complete list in her purse. She had arrived in the emergency department nine hours prior and still had not been given any insulin or pain medication. Lorre and her husband both worked in Healthcare IT. They immediately went to the charge nurse and didn’t leave her side until Lorre’s grandmother received her medication. When they talked with the nurse afterward, she admitted the emergency system and the hospital EMR (Electronic Medical Record) system weren’t integrated or interfaced. The nurses on the floor had no way of knowing what occurred in the emergency department until the notes were entered much later. Two years ago Lorre’s youngest daughter Brianne was in a skiing accident and ended up in the hospital in La Jolla, CA. She was diagnosed with pneumonia one month later. Her lung was 70% filled with fluid and she wasn’t responding to the treatment. Lorre kept telling the pulmonologist about the accident and he dismissed it. Finally, Lorre asked Brianne to show the doctor a picture of herself purple from her neck to her buttocks and with a fractured collarbone. The doctor said, “Oh My God, there must be tissue damage.” Due to this patient reported data and accompanying image, the treatment plan changed. Brianne was in inpatient care for 16 days and recovered. While Brianne was in the hospital in La Jolla, Lorre’s husband learned he needed a liver biopsy in Tucson. Lorre returned home. Her husband’s biopsy revealed liver disease. They gave him a 50% chance of surviving for 30 days. Lorre thought of all of the reasons they could beat the odds. They had good insurance, the ability to pay for additional attention, willingness to do whatever it takes and he was relatively young. Lorre’s husband was admitted into the hospital on July 2, 2012. She was very shocked by how present she needed to be just to keep everyone involved in treatment on the same page. There were teams of physicians, new nurses every couple of days, and a rotating group of aides. The staff was consistently forgetting his medication or mixing it up. Lorre had to be ever vigilant about what her husband needed, but also what they were doing or failing to do. The physicians ordered so many tests. Lorre believed that if they did everything they were told to do, they would get through it. Her husband contracted C-diff and hospital acquired pneumonia. He started to suffer from anxiety and became terrified at night. Lorre slept at the hospital and only left to shower and change clothes. They were in the hospital for 16 days straight, when a brave nurse took Lorre aside and told her she was fighting a lost battle. The nurse told Lorre one more hospital-acquired disease would be more than her husband could stand. He was dying. Lorre took him home and he died two days later. On July 3, 2013 Lorre’s father was diagnosed with stage 4-pancreatic cancer. He also lived in Tucson. Lorre took responsibility for him. Each time he was hospitalized (always at the same hospital using and electronic medical record system), Lorre had to go through the medication list several times until they could agree that it was correct. Regardless, many, many times Lorre received a call at 6am from the hospital pharmacy asking her to clarify the orders or provide them in their entirety. It was maddening to think that all of his information was in the system and literally a week after the prior visit they had to start from the beginning again. Lorre’s father died in November 2013. That is Lorre’s story of pain. I placed dice throughout this piece. A single die is placed next to everyone Lorre lost. Each die is either pressing Lorre down or separating her from the one she loves. I am sure that everyone who reads this can empathize with Lorre’s pain, but for those of us who work in technology and love the science behind evidence based medicine; the frustration in this tale is acute. 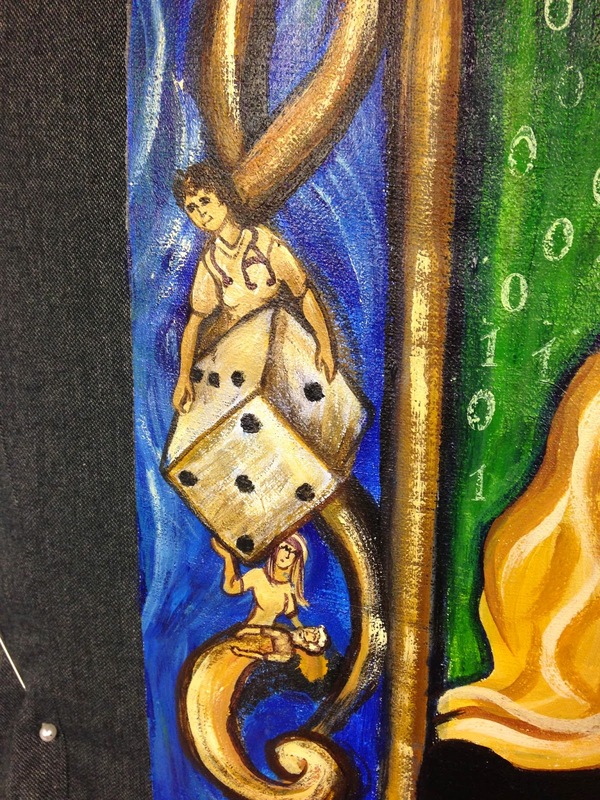 Though life itself can be a gamble, the protocol in medical care should never be a roll of the dice. Regina, that is one of the most touching stories. Thank you for sharing and for your friends bravery in sharing her story. Thank you Kourtney. Lorre's story was so challenging I thought it needed to be shared with the world. Perhaps it will inspire others toward needed change in healthcare. So much loss for such a young,brave,strong advocate. The irony is so thick it about chokes the life right out of you just reading this story. How is it over and over and over again we end up protectiing our loved ones from the very healthcare /IT system designed to make them well and keep them safe. Herein lies an even larger proplem---how do we get the caretakers to care enough to protect and help THEIR patients too? Thanks for sharing that explanaton The serendipitous (luck of the toss of the dice) makeup of our lives always gives me pause.